ASL's range of Awarding Body solutions, that can give your business a distinct advantage over your competitors. 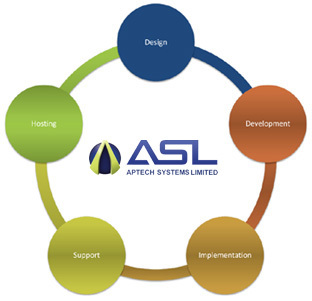 APTECH SYSTEMS specialise in providing enterprise-class IT and network support to a wide range of companies. In every organisation, IT is becoming an important element. IT not only creates fundamental changes in the way organisations conduct business but provides new business opportunities, reduces costs, and facilitates exchanges with business partners and customers. The downside is that many companies may have the technology but lack the right attitude to use it effectively or align it with the organisation’s objectives. This results in ever expanding internal processes without effective direction. To compliment your business strategy you will need an IT strategy that defines “competitive advantage” and the value technology can offer your products, services and business processes. The right IT strategy will enhance your businesses chance of success. APTECH SYSTEMS consultancy focuses on analysing the IT system and providing a solution which 'Fits' between organisation vision, objectives and IT resources. At ASL, we have a dedicated team of IT consultants with considerable experience of business and technical operations in almost all sectors. We are ideally positioned to help your business with it's IT strategy through our IT consultancy service, ensuring that the systems implemented today are not just temporary fixes or "short term" solutions, but evolves with your changing requirements. Our aim is to work with you to establish the solutions suitable for your particular needs, to provide value for money and to maximise your business potential. We are a full Service Technology Company. As a company we offer the “Total IT Solution”. We provide end-to-end solutions from design to hosting. Our proven customisable applications are innovative in design and use the latest development technologies ensuring excellent performance, security and portability.